This low fat appetizer is like a crustless quiche, served warm or at room temperature. The sorrel has a lemony taste, and is easy to grow as a garden perennial. *substitute a pack of frozen chopped spinach if no sorrel is available: pre-cook and drain in the same way as below. Still very good but missing that lemony zing. Preheat oven to 325 degrees. Chop sorrel leaves. Drop in boiling salt water for a minute. Drain well in a strainer, squeeze out additional liquid by hand, and pat dry with a paper towel. Let cool. Drain cottage cheese in the strainer and press out excess liquid. Put all ingredients except pine nuts in food processor and blend until smooth. Then mix in pine nuts and adjust seasoning. Bake in a buttered 9” round pan for about an hour, until lightly brown on top. Let cool. Cut in wedges. Serves 12 as an appetizer, 8 for lunch. Garnish with small fresh sorrel leaves, cherry tomatoes both red and yellow, extra pine nuts if you have them and extra pine nuts. 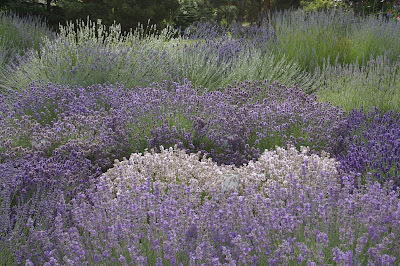 Not all lavender has the same great flavor. Some species taste like camphor. For cooking use any variety of Lavandula angustifolia, sometimes called English lavender. If you don't grow your own and are buying dried lavender buds, make sure it's 'culinary grade' not just anything they have lying around a cosmetics chain store. Heat the oven to 325 degrees. Grease a 9-by-f-by-3-inch loaf pan. Cream the butter and sugar until soft. Add the eggs one at a time until smooth; add the rind. Pinch the lavender with your fingers to release more oils and add to the mixture. Combine flour, baking powder and salt, mixing lightly with a spoon. Add the dry ingredients and milk to the creamed mixture, alternating in two or three pours. Bake for about an hour, or until a toothpick inserted into the center of the loaf comes out clean. While the cake is baking make this glaze. 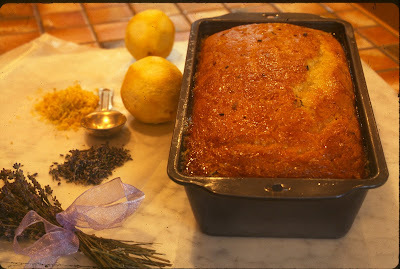 Mix all ingredients in a small saucepan, pinching the lavender buds with fingers before adding. Bring to a boil, stirring to dissolve the sugar. Remove from stove. When the cake comes out of the oven, let cool for about 10 minutes, turn out of the pan and place on a plate, right side up. Prick the top with a fork in several places and pour the glaze over the loaf letting it absorb slowly. Let the cake cool before slicing. Pass any extra glaze in a small pitcher when serving the slices. Line a strainer or colander with rinsed cheesecloth, or if you don't have that, position several drip coffee filters inside. Spoon unflavored yogurt in the filters or cheesecloth. Place the colander on a deep dish, cover loosely with wax paper, refrigerate, and let the yogurt drain for eight hours or overnight. Put the drained yogurt in a container and add 1 to 2 tablespoons of your favorite finely chopped fresh herbs like thyme, rosemary and chives. Spread on crackers, celery or cucumber slices. 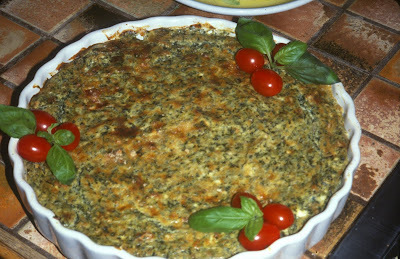 The tangy herb cheese recipe is on my Thanksgiving recipe list. Thanks Ellen. DON'T I GET A SAY?